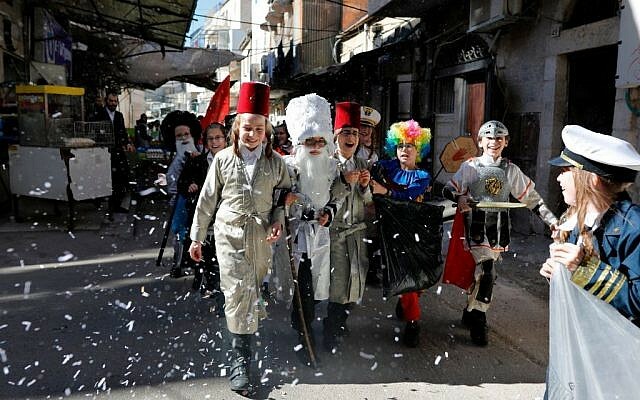 Unlike Passover or Rosh HaShanah, Purim is relaxed (except for parents making children’s costumes). It doesn’t come “early this year,” or “late,” but as on-time as a birthday. With its exuberance and innocence, it is a holy day without sermons or scolding, without suits or ties. It is so associated with masquerade, carnivals, candy, and drinking that it is easy to forget how foreboding the Megillah is, how haunted, how current. For all of our concern of late of rising anti-Semitism here at home, from the far right and the far left, it is important to maintain a sense of historical context. Jews once feared the church; now no one loves Israel more than evangelicals. A generation ago, Russian Jews teaching the Alef-Bet were sent to prison camps in Siberia; today, Russian President Vladimir Putin, for all his dangers, allows yeshivas and Jewish institutions throughout his empire. Not long ago, Jews were kept out of universities, hotels, social clubs, and neighborhoods. Today, anti-Semitism often is more subtle. And yet, anti-Semitic crimes continue to top the FBI hate crime chart every year of the 21st century, under every president. And in Europe, anti-Semitism — sometimes violent — is on the rise and increasingly dangerous. The Megillah can be interpreted as espousing the use of deep diplomacy to ward off destruction. Mordechai and Esther don’t take up the sword, they use their wits to defeat Haman. But the Jews did take up arms to defend themselves and kill those who rose up against them. And certainly Mordechai and Esther risked their lives to stand up for their people.